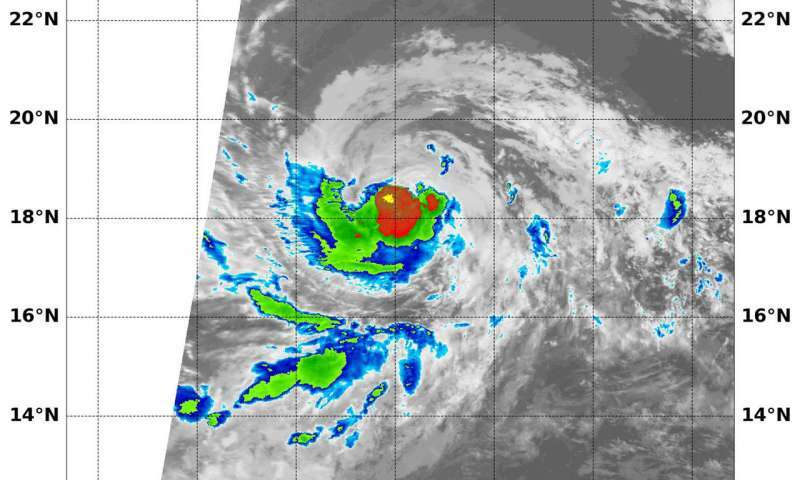 NASA's Aqua satellite found strong storms circling the center of Tropical Storm Kristy. On Aug. 10. Infrared data from NASA's Aqua satellite provided forecasters with temperature data that showed strong storms. On Aug. 10 at 4:45 a.m. EDT (0845 UTC) the Moderate Resolution Imaging Spectroradiometer, or MODIS, instrument aboard NASA's Aqua satellite analyzed Tropical Storm Kristy's cloud top temperatures in infrared light. MODIS found cloud top temperatures of strongest thunderstorms around Kristy's low-level center were as cold as or colder than minus 70 degrees Fahrenheit (minus 56.6 degrees Celsius). Cloud top temperatures that cold indicate strong storms that have the capability to create heavy rain. The National Hurricane Center (NHC) noted at 5 a.m. EDT (0900 UTC), the center of Tropical Storm Kristy was located near 18.2 degrees north latitude and 129.8 degrees west longitude. Kristy is far from land areas and about 1,325 miles (2,135 km) west of the southern tip of Baja California, Mexico. Kristy is moving toward the north-northeast near 9 mph (15 km/h). A turn toward the north-northeast is expected later today, followed by a turn back to the north with a decrease in forward speed on Saturday, Aug. 11. The estimated minimum central pressure is 991 millibars. Maximum sustained winds are near 70 mph (110 kph) with higher gusts. While little change in strength is expected today, there is still a chance that Kristy could become briefly become a hurricane this morning. Gradual weakening is expected to begin by tonight and continue through the weekend.